Join the CD Monitoring Team for their Fifth Quarterly Community Forum on Tuesday, April 2, 2019 from 6:00PM- 8:00PM to provide Baltimoreans with an update on its progress. The event will be held at Union Baptist Church, 1201 Druid Hill Ave., Baltimore, MD, 21217. Para más información sobre el Quinto Foro Trimestral de la Comunidad. ¡Haga clic aquí! Join the BPD Monitoring Team for their Second Quarterly Community Report Forum to provide Baltimoreans with an update around their work on July 18, 2018 from 6:00PM- 8:00PM. The event will be held at Sacred Heart of Jesus Parish located at 600 South Conkling Street, Baltimore, MD. (Baltimore, MD) – After consultation with the Baltimore Police Monitoring Team, U.S. District Judge James K. Bredar has set a schedule over the next year for the Monitoring Team and the parties to update the Court on the Baltimore Police Department’s compliance with the Consent Decree. Judge Bredar is overseeing the Consent Decree’s implementation. The schedule includes both formal public hearings, to be held quarterly, and informal progress reports, which will be delivered to Judge Bredar in his chambers on a monthly basis. At the public hearings, BPD, DOJ and the Monitoring Team will each provide a report on BPD’s progress toward achieving the objectives of the Consent Decree. The initial public hearings will necessarily focus on the areas targeted for reform in the First-Year Monitoring Plan. However, the public hearings will also provide an opportunity for the parties and Monitoring Team to update the Court regarding BPD’s progress toward achieving all of the objectives of the Consent Decree. The monthly meetings in Judge Bredar’s chambers will each focus on a discrete area of the Consent Decree. At every meeting, BPD, DOJ and the Monitoring Team will provide its own report to Judge Bredar about the progress BPD has made toward achieving the reforms required by specific provisions of the Consent Decree and the additional measures, if any, BPD must take to achieve and sustain substantial compliance in that area. Because these will be working meetings among BPD, DOJ and the Monitoring Team, under the supervision of the Court, they will not be open to the public. However, the parties and the Monitoring Team will include all of their meeting reports in their presentations at the quarterly public hearings. The first several meetings will address areas that Judge Bredar and the Monitoring Team have prioritized based on input from community members (including police officers), DOJ’s investigative findings, and their own preliminary assessments. These are areas of critical importance to restoring public trust in BPD and ensuring that BPD has in place the proper institutional foundation to achieve long-term success under the Consent Decree. The February 2 session will focus on transportation of persons in custody. Judge Bredar will address this issue first because it is critical that BPD ensure that its policies, procedures and practices protect the safety and security of persons in their custody (as well as officers) during transportation. The March 2 session will address BPD misconduct investigations and discipline. The Consent Decree recognizes—and recent events demonstrate—that fortifying BPD’s internal affairs function is crucial to achieving sustainable institutional reform. Without a credible, robust system for holding officers accountable for unconstitutional and otherwise unlawful conduct, the changes the Consent Decree mandates in important areas like stops, searches and arrests, impartial policing, and use of force are likely to prove elusive. The April 6 session will address stops, searches and arrests. One of DOJ’s principal findings was that BPD engaged in a pattern-or-practice of stopping, searching and arresting individuals in violation of the Constitution. Ensuring that BPD’s routine interactions with civilians comply with the law is vital to achieving compliance with the Consent Decree and restoring public trust in BPD. The reports made at the February, March and April meetings with Judge Bredar will be incorporated into the public presentations made by BPD, DOJ and the Monitoring Team at the initial quarterly hearing at the United States Courthouse on April 13. Judge Bredar will adopt a similar schedule for public hearings and in-chambers meetings with BPD, DOJ and the Monitoring Team in subsequent years. The Baltimore Police Monitoring Team oversees the implementation of the Consent Decree – a judicially-enforceable agreement – between the Baltimore City Police Department, the City of Baltimore and the United States. The Consent Decree requires BPD to adopt a number of specific reforms aimed at ensuring effective, safe, and constitutional policing. The Monitoring Team’s job is to help the Court gauge whether, consistent with the Consent Decree’s objectives, BPD is achieving meaningful reform by making tangible changes in its policies and practices for the benefit of Baltimoreans. The Monitoring Team also provides technical assistance to BPD as it seeks to implement the reforms required by the Consent Decree. The Monitoring Team includes specialists in policing and police reform, civil rights enforcement, psychology, social science, organizational change, data and technology, and community engagement. (Baltimore, MD) – The Baltimore Police Monitoring Team has issued for public comment a draft first-year budget, which estimates the time and expenses needed to accomplish the team’s work under the first-year monitoring plan. The first-year monitoring plan, a draft of which was issued for public comment on January 9, is intended to guide the initial efforts of the Baltimore Police Department (BPD) to comply with the requirements of the Consent Decree BPD entered into with the United StatesDepartment of Justice (DOJ) last year. The draft budget and the draft monitoring plan can be found at www.bpdmonitor.com/first-year-monitoring-plan. The public comment period on the draft budget runs from January 29 through February 9. The public comment period on the draft monitoring plan is correspondingly being extended through February 3. Comments on the draft budget can be submitted by completing a survey form online at https://www.surveymonkey.com/r/FirstYearBudget. The draft budget located at www.bpdmonitor.com/first-year-monitoring-plan contains instructions on how to submit comments electronically, in person, and by mail. The Monitoring Team, BPD and DOJ will consider the comments received, incorporate the comments into the budget as warranted, and submit a final proposed budget to the Court for review and approval on February 13. (Baltimore, MD) – The Baltimore Police Monitoring Team has issued for public comment the draft of a first-year monitoring plan intended to guide the initial efforts of the Baltimore Police Department (BPD) to comply with the requirements of the Consent Decree BPD entered into with the United States Department of Justice (DOJ) last year. The draft plan can be found at www.bpdmonitor.com/first-year-monitoring-plan. The public comment period runs from January 8 through January 29. Comments can be submitted by completing a survey form online at https://www.surveymonkey.com/r/BPDMTPlanSurvey. The draft plan located at www.bpdmonitor.com/first-year-monitoring-plan contains instructions on how to submit comments electronically, in person, and by mail. The Monitoring Team, BPD and DOJ will consider the comments received, incorporate the comments into the monitoring plan as warranted, and submit a final proposed monitoring plan to the Court for review and approval on February 5. (Baltimore, MD) – The Baltimore Police Monitoring Team has closely followed the events surrounding the cordoning off of the Harlem Park neighborhood in West Baltimore as the Baltimore Police Department (BPD) investigates the tragic murder of BPD Detective Sean Suiter. 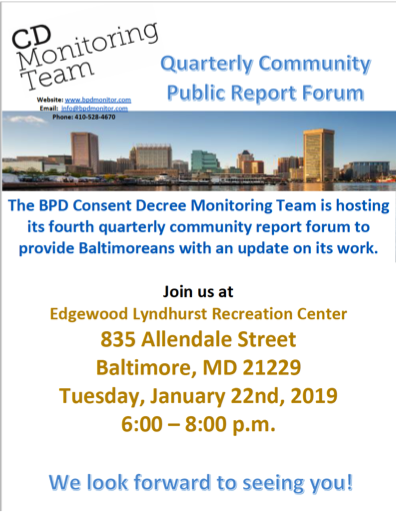 The Monitoring Team has an obligation to assess BPD’s compliance with the provisions of a Consent Decree that BPD, the City of Baltimore, and the U.S. Department of Justice signed earlier this year. A number of provisions in the Consent Decree address how BPD officers conduct stops, searches, and arrests. As part of its assessment of BPD’s compliance with those provisions, the Monitoring Team is examining BPD’s recent actions in Harlem Park. If any individual believes he or she has been stopped, searched or detained without justification, he or she should contact the Monitoring Team by emailing info@bpdmonitor.com or by calling (410) 528-4760. The practices and procedures of the Monitoring Team are still taking shape. The Monitoring Team was appointed on October 3, less than two months ago. Under the terms of the Consent Decree, the Monitoring Team is presently working with BPD, the City, and the Department of Justice to develop a Monitoring Plan. The Monitoring Plan is not due to be submitted to the Court for approval until January 2018. The provisions of the Monitoring Plan will determine how, going forward, BPD will provide the Monitoring Team timely, full and direct access to BPD employees, facilities, and critical incident crime scenes so that the Monitoring Team may carry out its obligations. (Baltimore, MD) – The Baltimore Police Monitoring Team is presently developing a Monitoring Plan for its work under the Consent Decree between the Baltimore City Police Department, the City of Baltimore, and the Department of Justice’s Civil Rights Division. The plan will be reviewed by the parties to the Consent Decree, and once finalized, submitted to U.S. District Court Judge James K. Bredar for his approval. All forums will run from 5 p.m. to 8 p.m. Participants need only attend one forum but are welcome to attend as many as they choose. Registration for the forums is suggested, but not required. Registrations is requested so that the Team can plan appropriately for seating and serving light fare. Register by emailing info@bpdmonitor.com. During the forums, the Monitoring Team will inform community members about its responsibilities under the Consent Decree and will seek to gain insight into community expectations about the reforms and reform process envisioned by the Consent Decree. Trained facilitators will focus participants on the community-engagement objective of the forums using inclusive, neutral, community-based facilitation techniques. To receive alerts and information from the monitoring team, sign up for communications at www.bpdmonitor.com or contact info@bpdmonitor.com.